We should recognize too, that the call to legalize all drugs will have extremely negative outcomes. Whether all types of drugs ought to be legalized is a rather interesting question—one fraught with consequences, as are all important questions. Drug legalization was an idea once prominent exclusively within the province of the 1960s and 70s radical Left (in the age of the “hippie”). Now, libertarians join them in espousing the desire to see some of the foulest substances known to man as accessible to people as a loaf of bread or, less controversially, as alcohol or cigarettes. This is misguided. Drugs ought to not be legalized. There are several germane points to make. First, it will not be enough to say that I am being “inconsistent,” i.e., that, since I am okay with alcohol’s legality, why not weed, or cocaine? This is because alcohol has certain good, compensatory qualities. It is often employed as a social lubricant. People use it to fit in or to have fun, to loosen up. Second, I readily admit that marijuana seemingly has certain of the same effects. I am open to that idea, but it will depend on the side-effects of using it. (I will deal primarily with marijuana in these remarks because many plausibly believe it is relatively or totally harmless, and two states have legalized it for recreational use. As goes marijuana, so would all other drugs. Marijuana is the “outcome hinge” upon which any further steps regarding drugs rest.) Third, in other words, there are basically no good effects to smoking cigarettes. They quickly generate a dependence in people, and the chances of having a heart attack or stroke, and contracting lung cancer jump sharply. There is a social benefit, sure, but it is often just outcasts, huddled around their slender sticks of death and cancer, who derive any positives. But if something happens because of our use of drugs—addiction, hard times, economic deprivation, disease, etc.—we will have support systems to help us. We have social cachet. Our reputations will likely not be ruined. We will simply go into therapy and re-emerge 6 months later ready to once again tackle our dreams. In addition, we should recognize too, that the call to legalize all drugs will have extremely negative outcomes. Even the New York Times acknowledges as much in a recent story on a study executed by two Princeton economists who report that there is an epidemic of abuse of opioids, heroin, and alcohol savaging communities of working class whites of middle-age. Their death rates have risen, not fallen. From 1999 – 2014, the death rate for whites aged 45 – 55 with only high school diplomas or less increased by a whopping 25%. Every other group’s death rate during this time period declined. This kind of thing happens only after periods of intense social crisis or collapse (think immediately after the collapse of the USSR, or Europe immediately after WW II). And this is all happening here in the US. That is unfathomable, and it is shameful. What will happen this time around with drugs is what has always happened when so-called progressive ideals are pushed for socially and then given the law’s blessing: The social and cultural elites of our country—you and I among them, Erin—will be now free to try them out, free of penalty. As will others, yes. But if something happens because of our use of drugs—addiction, hard times, economic deprivation, disease, etc.—we will have support systems to help us. We have social cachet. Our reputations will likely not be ruined. We will simply go into therapy and re-emerge 6 months later ready to once again tackle our dreams. The working class, i.e., the vast swathes of non-elites that inhabit our country, do not have these same advantages. We will now turn to the data. I. Would Relaxation Of Penalties On Marijuana Increase Marijuana Use? II. Is Marijuana Bad For You? III. What Are The Costs Of The Drug War? Some people enjoy smoking marijuana. The opening of a permanent criminal record may mean arrests are worse than estimated. He can not find good statistics on how often this happens, but does note that decriminalization prevents a record from being opened. The loss of 8 IQ points may have wider social effects than estimated, since IQ affects, for example, crime rate. Legalizing marijuana might remove a source of funding for organized crime. Ultimately, my position to resist marijuana’s legalization is for reasons of principle rather than because of any sort of empirical insight (even in light of the slightly-favorable-toward-marijuana-legalization analysis provided above). Finally, at bottom, it is doubtful that legalizing yet another substance or method for escaping reality and avoiding life and one’s responsibilities can be good. And so, it is thus that I resist the legalization of all drugs. “although most of them would not be exactly fine upstanding citizens” Why? Because they smoke pot? Let’s not intentionally try to alarm and worry the public about legalizing “all drugs” right now. That concept is often used as a scare-tactic by prohibitionists in an attempt to frighten the public away from marijuana legalization by clumping marijuana legalization in with the legalization of other drugs which are far more scary and dangerous than relatively benign,often healing marijuana. Marijuana is just about the safest drug out there. Legal or not, and much less dangerous than perfectly legal, widely accepted, endlessly advertised, often glorified alcohol consumption. 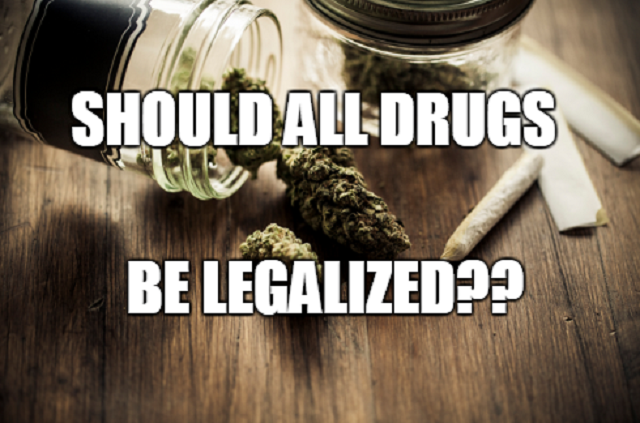 Which makes marijuana legalization unique, and certainly a much different, and far more urgent matter than the legalization of “all drugs” right now. Let’s not lose focus of the real issue at hand here. Marijuana, the only currently illegal recreational drug that is much safer than perfectly legal alcohol. The only danger with pot is cops. The police will shoot your dog, if you’re lucky.